I second that, can somebody please add the 70D to the list? I third that. Please, add 70D to list. Thanks! According to the chart we can use a CF and SD card at once for 5d3, 100+20 mB. How is that possible. I tried inslatting ML on the SD card while having Cf card as well inside but the raw recording is limited to that of the SD card. Isn't the ML supposed to be installed on the SD card? My aim is to use two cards to boost the speed capacity instead of getting dropframes or other issues with a single Cf-card. Only works with mlv_rec. 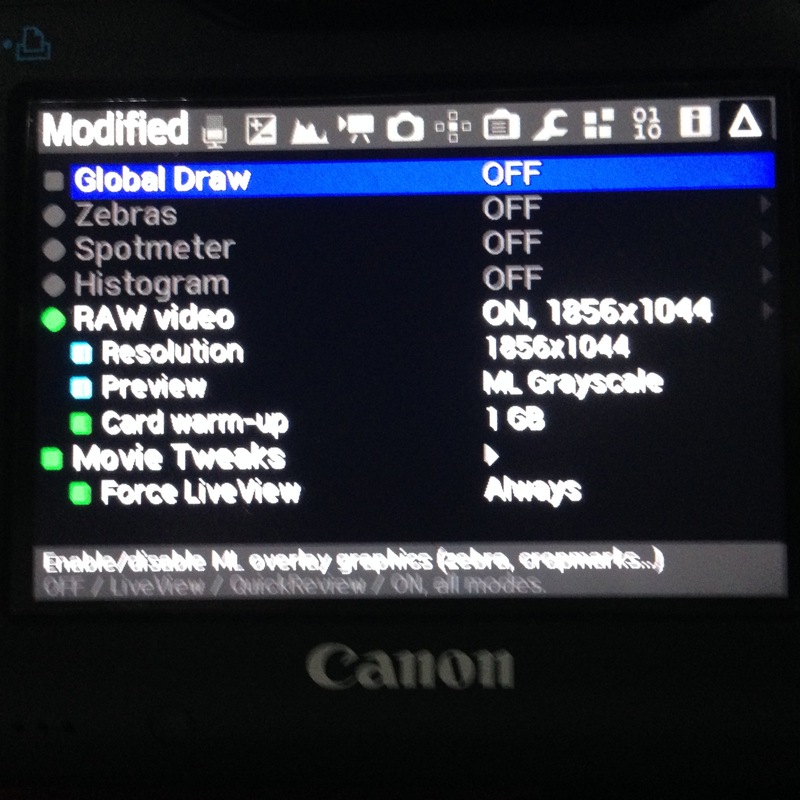 Turn on "Card Spanning" in the raw video submenu. 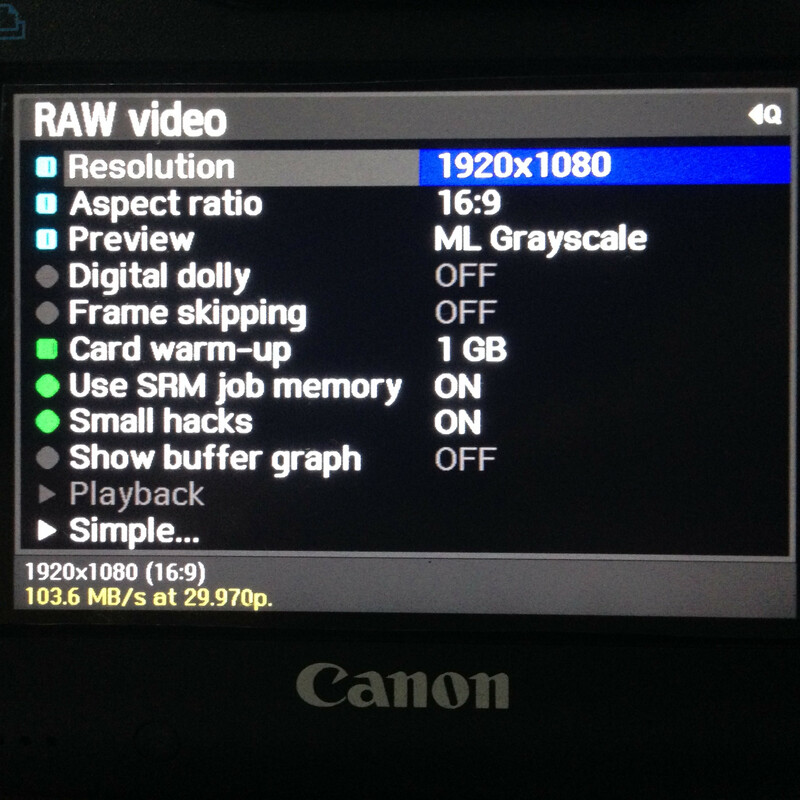 Sorry if this is a redundant question, but has anyone actually gotten 1080 30fps RAW working on their 5D M3? I'm having trouble with it and I have all the hardware (including a 64GB KB CF 1066x card). The 5D can record RAW at 24fps with no issue (it writes with a speed of 95MB/s) but once I bump it to 30fps, it won't record longer than 12-40 seconds (even though the right speed is around 93-95MB/s). 95 is less than 103. That is your problem. No I understand that, I'm just trying to discern if it's the card's fault for not writing fast enough (which is odd since I using a 1066x KB CF card and a 160MB/s Sandisk CF card) or that my 5D can't write at that speed. Benchmark the card on a computer. If it's higher than 95, then it's the camera's fault (which it probably is). There are quite a few variables that affect write performance of the camera (for one example CPU load). This is why you're supposed to do the card benchmark in playback mode (fewer Canon tasks are running in playback mode, so overhead that might reduce write speed is minimized). 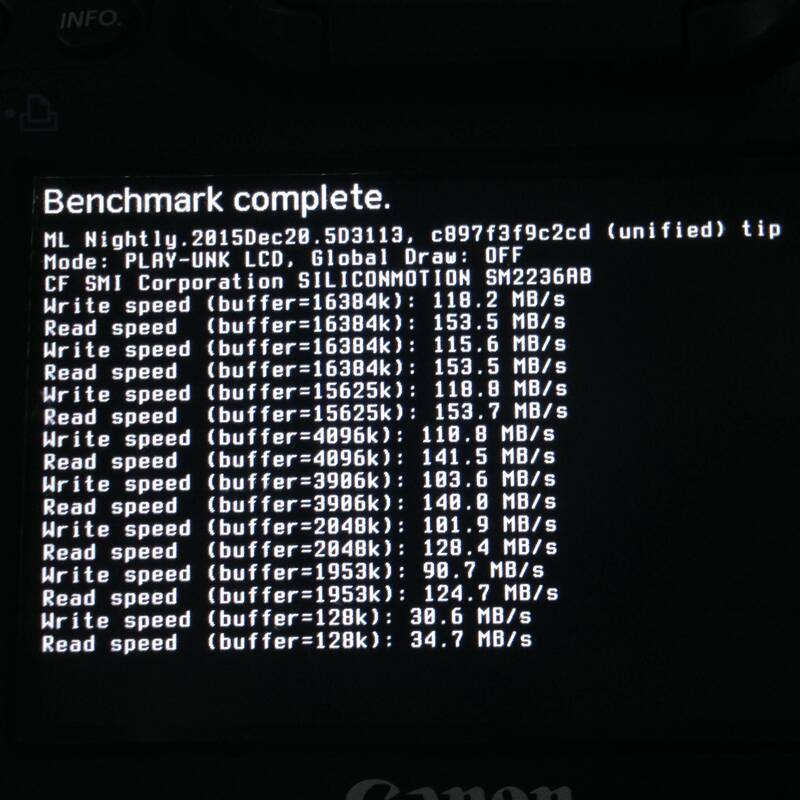 Many 5D3 users have reported that 1.1.3 has a lot better performance than 1.2.3. This is likely due to the fact that Canon changed a ton of low level stuff in 1.2.3 to support mirrored display (both external and camera LCD at the same time), these changes add extra overhead affecting real world write speed performance. Of course you should already know this, b/c there were already posts in your other thread about 1.1.3 vs 1.2.3, but it seems you are unwilling to try it? You should also compare the performance of mlv_rec and raw_rec, they are likely to vary. So I downgraded from 1.2.3 to 1.1.3. I ran the benchmark (while in video mode) in the playback menu and averaged about 119MB/s of write speed and 154MB/s of read speed. For a while, I was actually able to record at 1080p RAW; even the 103.4MB/s text was green. Now however, I can't record for more than 46 seconds and the text is back to yellow and red. Q: Global Draw OFF and exFAT file system with MLV option "Files > 4GiB (exFAT)" enabled? So in mlv_rec, global draw is indeed off and U do have the exFat 4GB override enabled (and yes, I formatted the card in exFat prior to testing). Despite this, mlv_rec will get me 20 seconds of recording time while raw_rec will get me about 40 seconds. 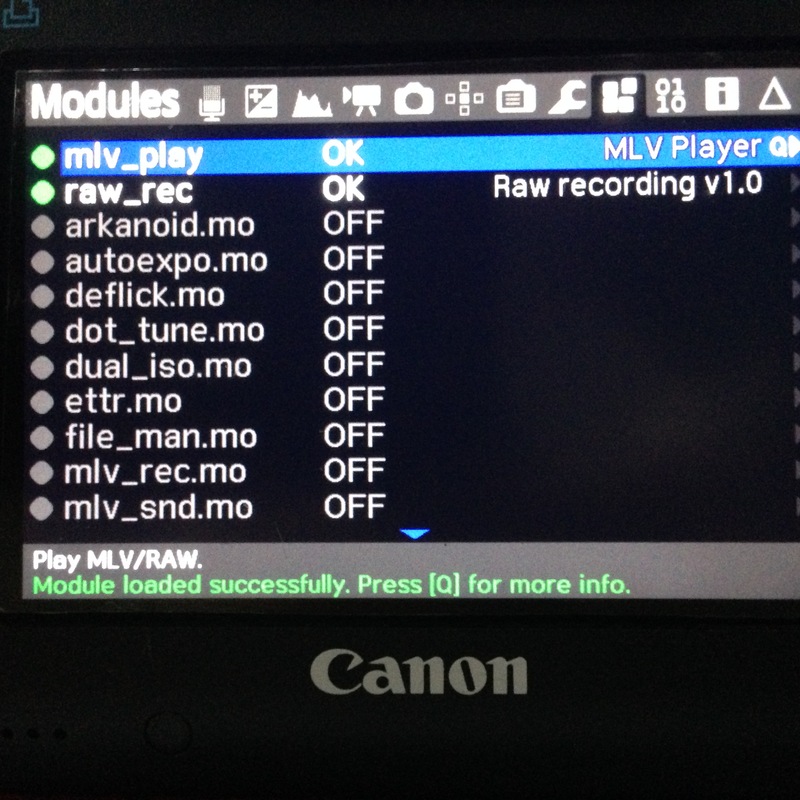 File size for MLV recording after breaking? Walter I'm sorry for not replying so soon. I was away from my computer the past few days. Yep, global draw is off. Here are some screenshots from my 5D. Hopefully they might give us insight was to why this is happening. (Wanted to insert the pictures directly, but they were too large so I had to use the URL instead. You should add both model designations to the chart. You should add the 70D to the RAW capabilities chart. Hey! im newbie in videos so forgive if im asking anything stupid. 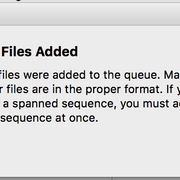 Just that when I try to convert raw files to DNG using RAW MAGIC LITE, sometimes it pops this message here. I checked the raw files and everything looks fine, and when I try it again with the same file it worked, but mostly keeps popping this message which is quite annoying. Happened to anyone too? How can I fix this? Are these current updates and stats for the 100D true? And if so, could we expect some cool improvements to the 7D also? Don't get me wrong I love my 7D+ML RAW video combo but so far, its been the 5Diii and now the 100D which have added improvements lately but nothing for the 7D. Does 7D support ML RAW Video, why is it marked in red? Yes, and you are referring to an outdated screenshot of an unsupported spreadsheet (also outdated). He made remarkable progres with the Digic-4 based 5DMk2 which gives us some hope for the 7D too. My impression is that the current developers' efforts are mainly directed towards porting 4k-crop recording to the low-end models (Rebels and EOS-M) and there is substantial progress with that. I hope, once this effort is successfully completed, the good old 7D that I also love, will again receive the attention that it deserves. I think, this camera has the full potential to become the No. 2 camera for ML-RAW video after the 5D3, not only because of its fast CF-card interface but also because of this increadible filmic look that it provides. Until then, please be patient and use your 7D with one of the old builds. The 2520x1200 resolution of this camera at 12 bits uncompressed and 24 fps provides the most beautiful filmic look that I have ever seen from a digital camera. Probably it's just me but personally, I enjoy it tremendously! Yes, even without crop recording , its No. 2 camera for ML-RAW video because of its buffer speed. The amount of free space on the card does not change. To find out, you need to restart the camera. This is normal? Is the chart in the OP still relevant? Seems like there's been a ton of progress since the OP. Looks way out of date to me. Looks like the speeds are listed here also. Topic unstickied and locked. If anyone has updated content, feel free to start a new thread.